Ok, first of all tell me how many out of you have tried that awesome snack in US and Canada that is made of flavored ice on a wooden stick? Well, right now I am not much concerned with the snack but actually I am concerned with the wooden sticks because here we are going to use them in making multiple art crafts. 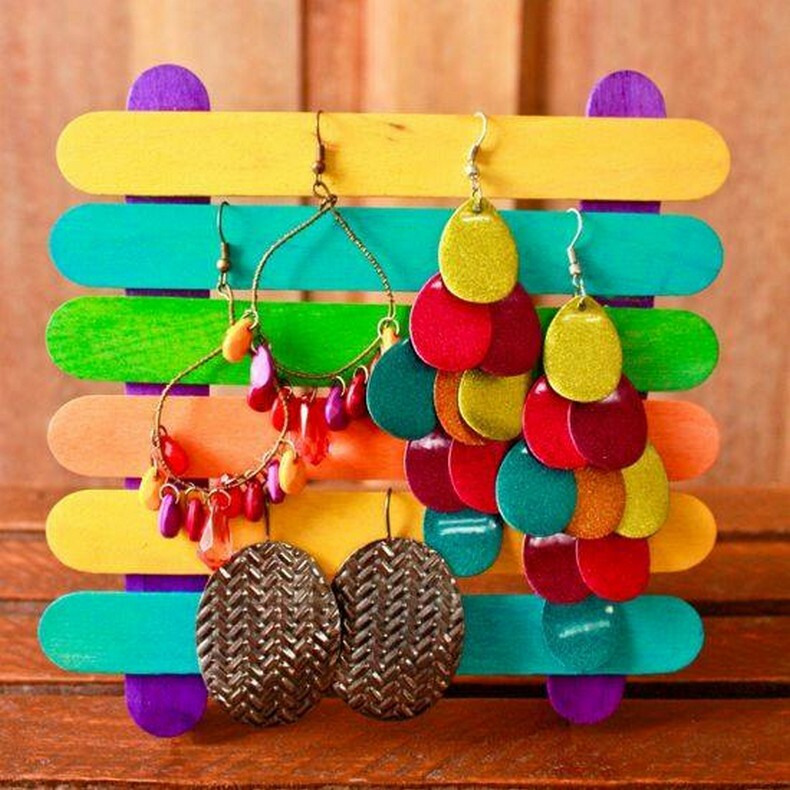 As they are easily available in the market and also very cheap cost wise so this is going to be a real fun making these art crafts using the popsicle sticks so just buckle up guys. Have you got some pet birds at your house? If yes then you must be aware that they like their meal to be served in this way hanging above from the ground. 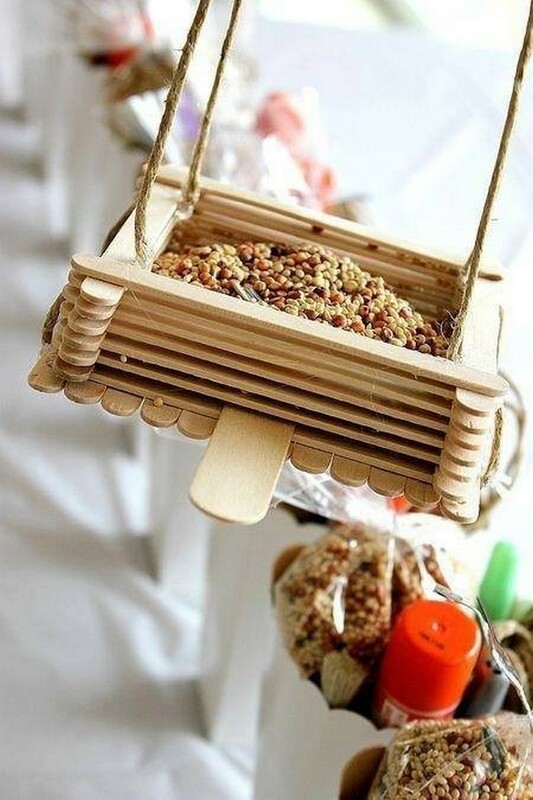 So this special birds meal box is prepared with same wooden sticks that we otherwise use for some other purposes. Such caricatures really look great when they are placed inside the drawing room or some other living rooms. 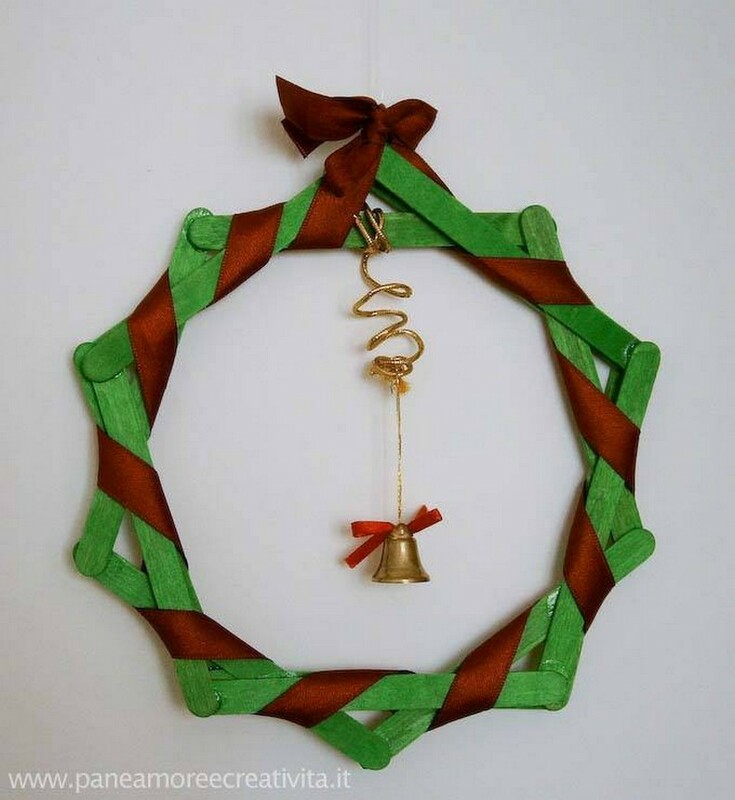 If you have to decorate your house perfectly then you can’t just rely on the ordinary market based art crafts. So this time try this unique creation at your own. 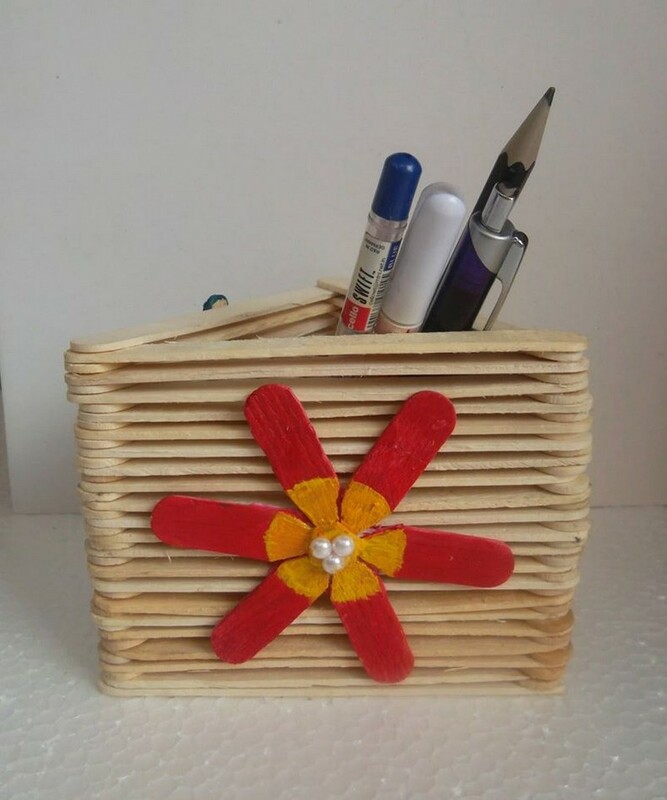 You just need some spare popsicle stick along with some artificial flowers and obviously some cool shades for making this décor item. You just have to combine the sticks together in this way, stain them and do some art work to draw the eyes and mouth line. 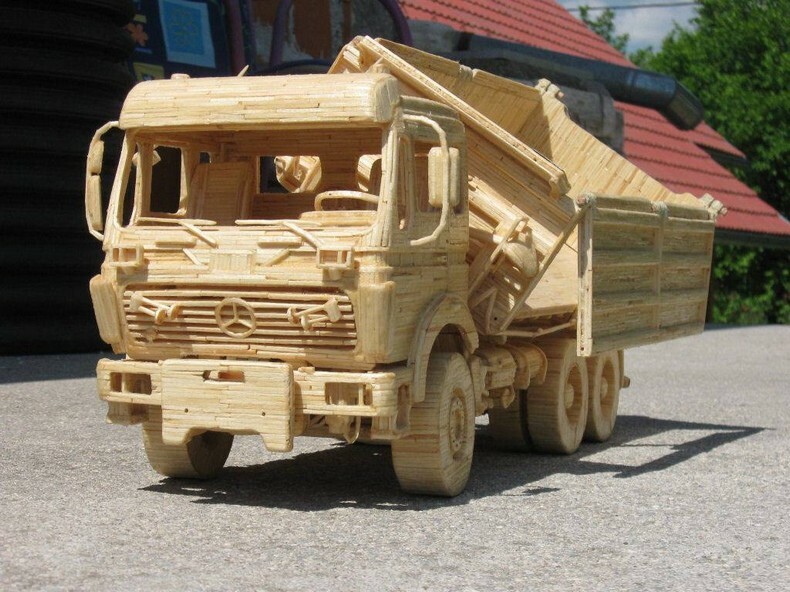 This is another smart art craft entirely made using the popsicle sticks. This is the quality of these wooden sticks that they just accept all the adhesives and pasting materials and they get stuck very finely as they are already shaped in a perfect manner. Place it on some hallway side table to show how art loving you are. And here we come across a beautiful doll house. Look at this splendid caricature, it has got it all that makes it a perfect doll house. 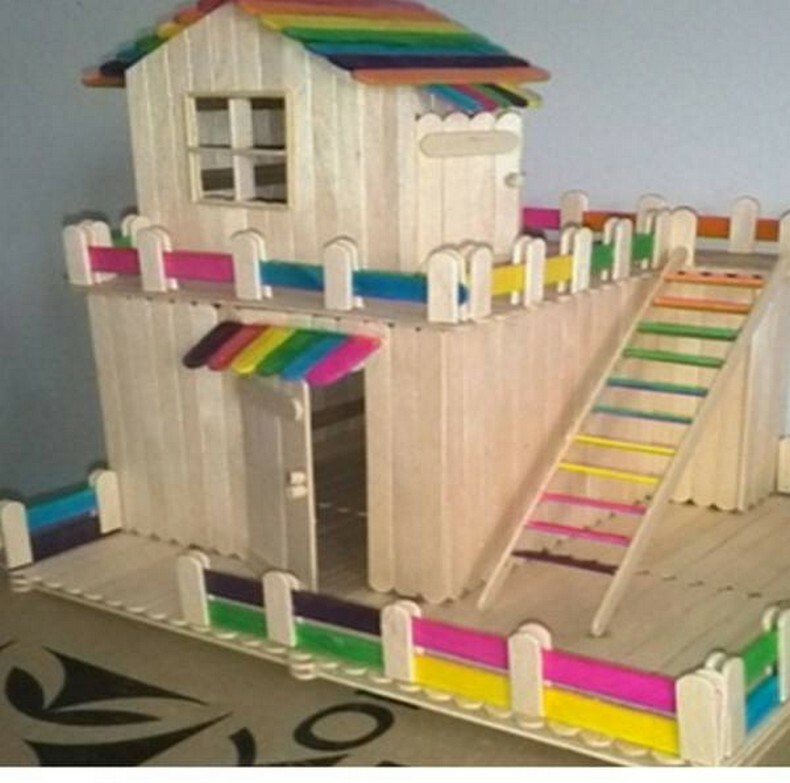 It has got a wooden deck on the front, it has got a proper balcony and a room too. Now we are turning towards some fine lighting work. Like it is a lighting installation that is all made using the same wooden popsicle sticks, and we have placed inside an ordinary Edison bulb that has turned it into an awesome lighting installation that is also like a perfect décor art craft. Wow, this is a next level chandelier that is entirely made with that tiny material. 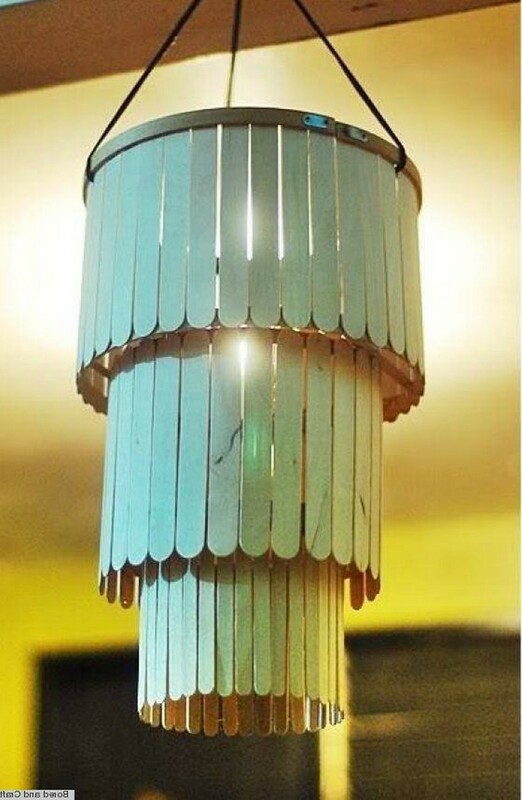 We have made the multi tiered shades around the bulb by combining the bunch of popsicle sticks all together making a declining pattern that really looks cool as a chandelier. Even this one is also handy. 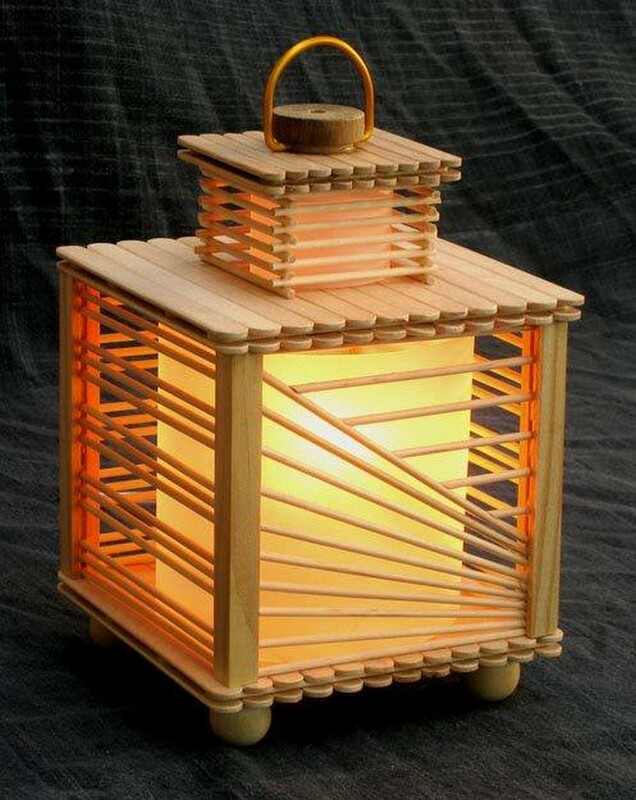 We simply used a frill made of silk all around the stained wooden sticks. And a reclaimed tiny bell that was borrowed from a broken toy and was no more in use. So this has turned to be smart wall art craft. 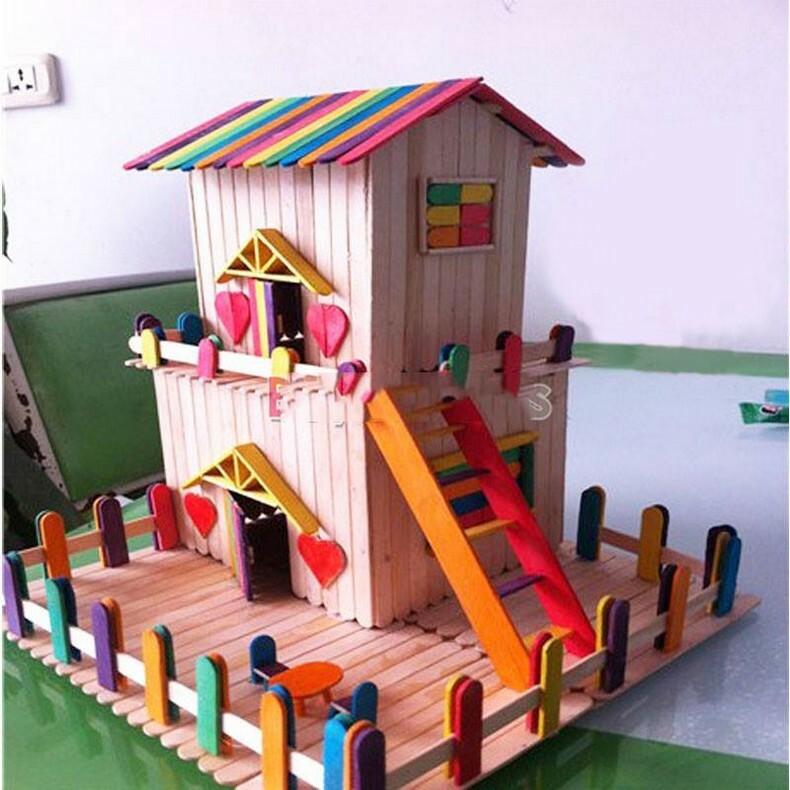 In some of the earlier projects we have made some actual kids houses using the wooden pallet planks and this time we have made a perfect caricature using the popsicle sticks. By giving multiple stain shades we have escalated the beauty of this little kids house caricature as the kids always adore the color shades. From the very beginning of my life I have always been in love with these flying machines. This ferocious flying bird proves to be lethal in the war zone. 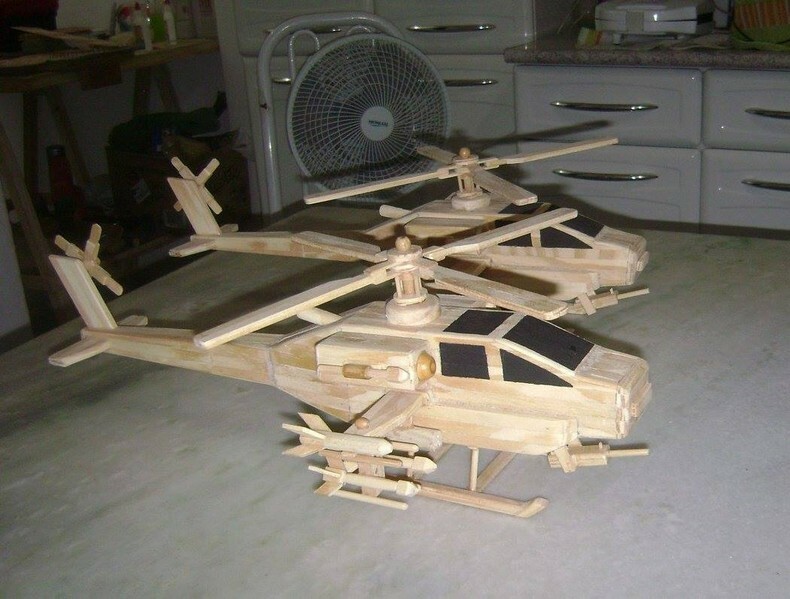 But we have developed a softer touch of the helicopters by recycling them with the popsicle sticks and I think the idea really worked. 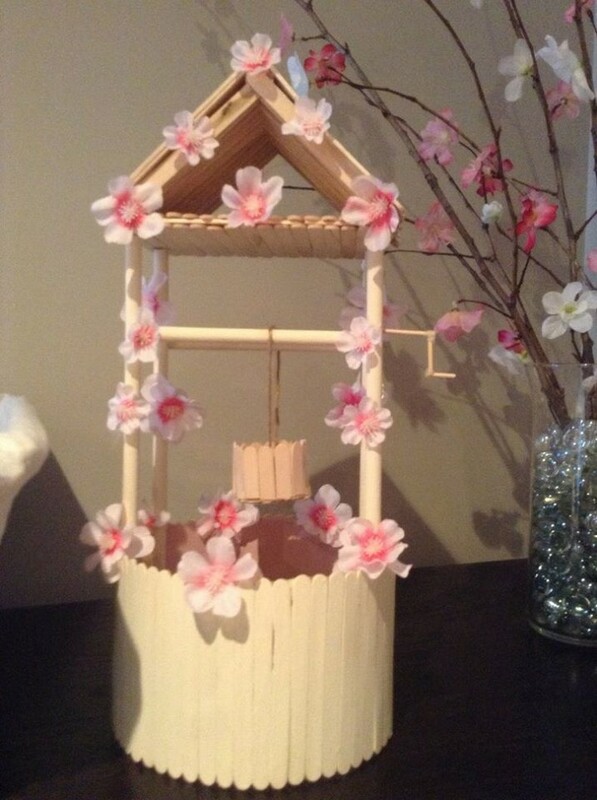 And this one is another softer depiction of the wooden sticks where we have made this jewelry stand with the popsicle sticks. And just look at this whole object, not only the jewelry has spread its colors here but the colorful jewelry box is looking even prettier. This four wheel drive wagon seems like a power house as we see a trolley being dragged behind it. 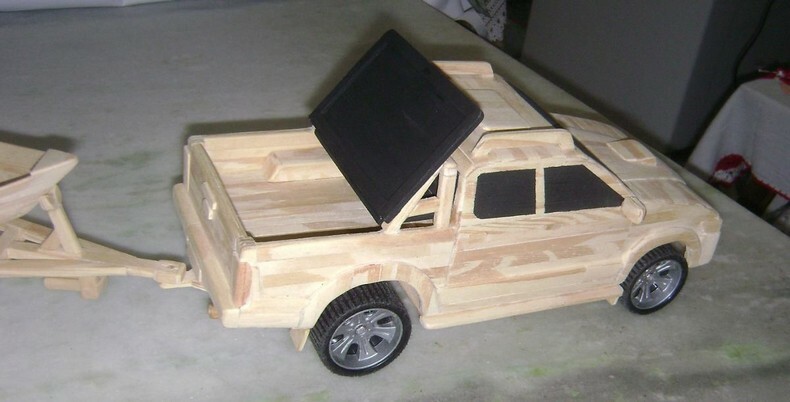 Using the wooden sticks in the whole main frame of the van and some reclaimed wheels of a broken toy car we have succeeded to give it a perfect shape like a functional wooden toy. Did you even do some book binding? Even if you have done it before but I am more than sure never in your life you would have been through this experience. 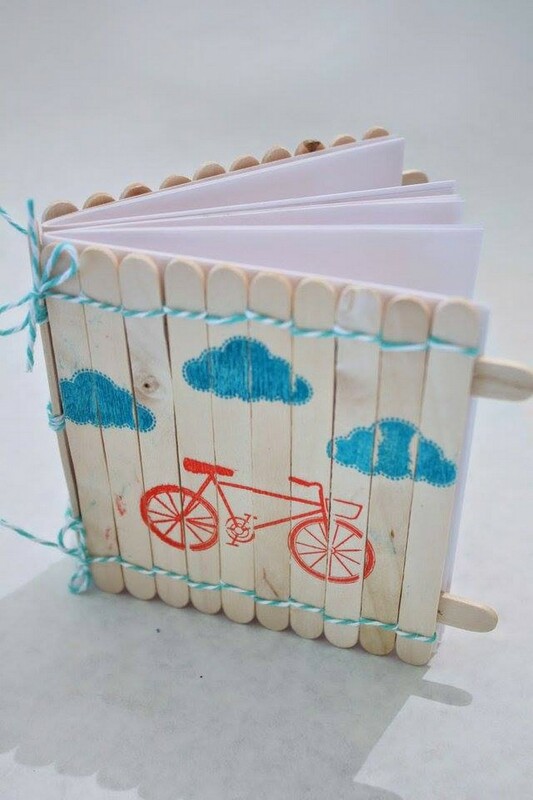 Here we have made a colorful kids diary wrapped up in a wooden stick made cover. 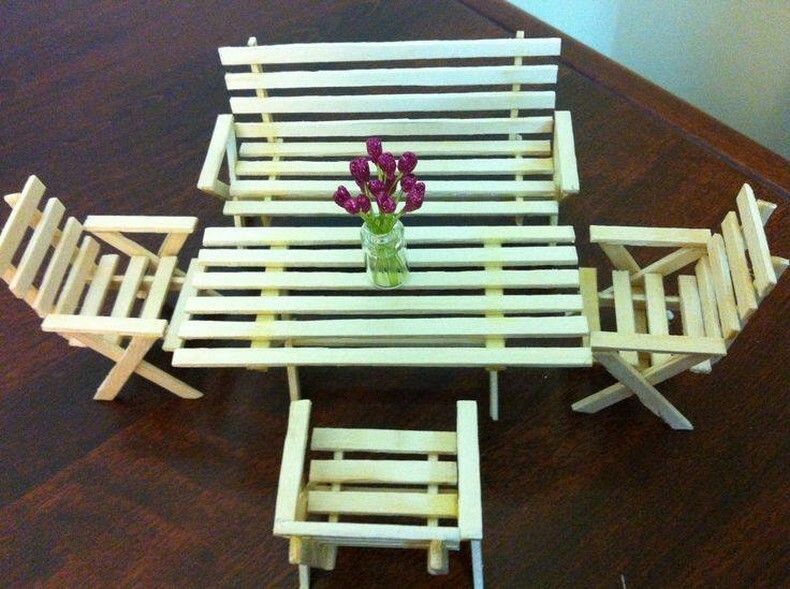 Awwww… I am simply loving this cute wooden furniture. This seems like a perfect wooden furniture range. 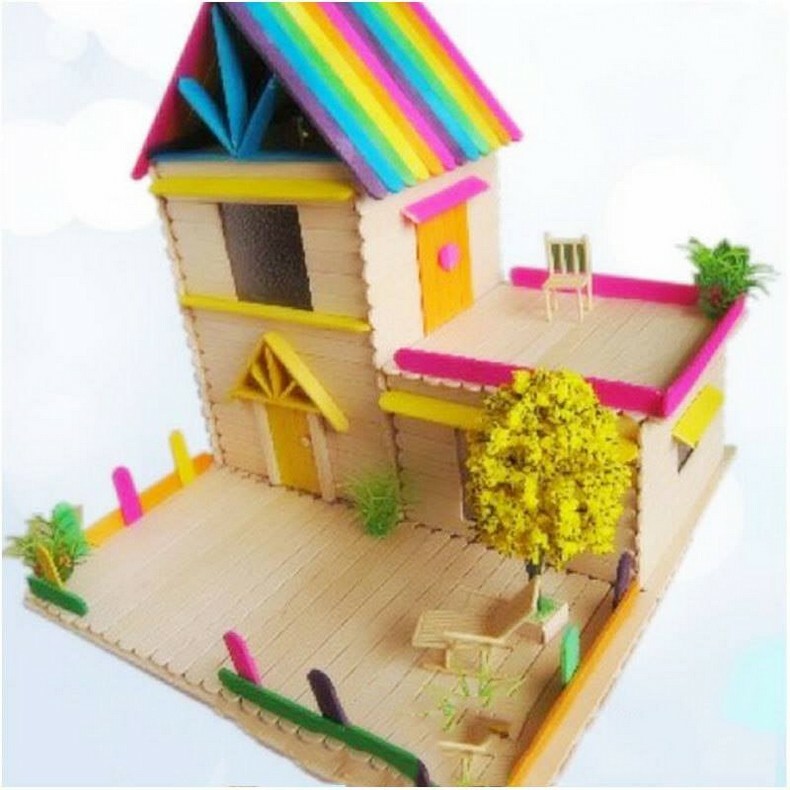 And I think this would be a great surprise for your daughter’s doll house and she would love to spend some of her best moments sitting on this remarkably designed wooden furniture range. Just remember the wooden pallet repurposed garden cabins that we have recycled some countless times. But this time we are making it with those tiny little sticks that could be purchased from the market very easily. Such models would also look perfect for the projects of engineers for giving their basic design. 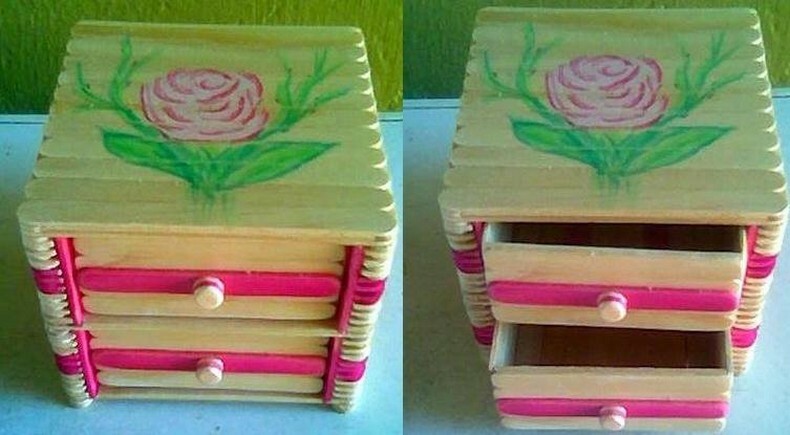 Do you like this cubical pencil container? 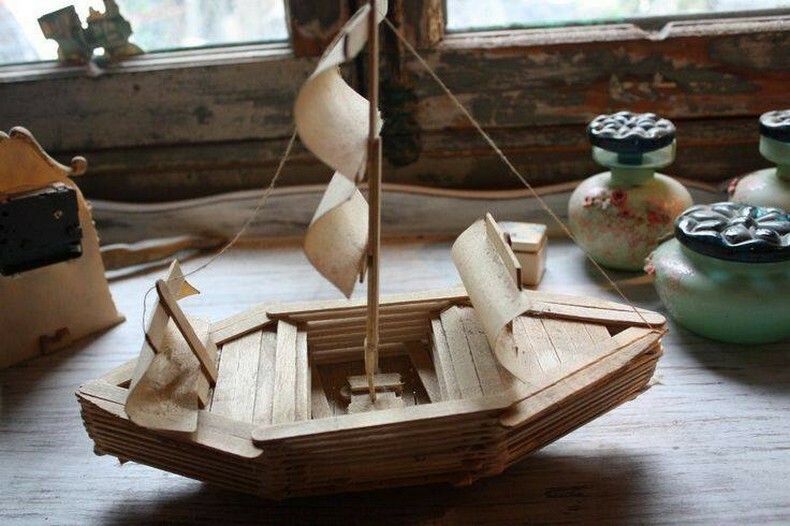 Trust me you are never going to find such cute and adorable crafts from the market. You have to make them at your own by idealizing these inspirations. 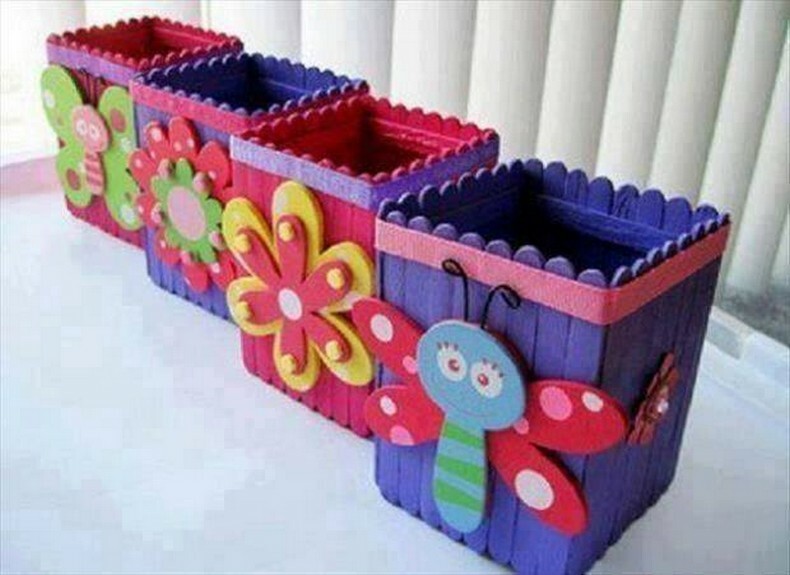 Use similar wooden sticks in the entire project and finally do some embellishment on the front. Okay, I think the guys are getting naughty with every next project like this huge caricature is so damn complex in its design. We have also exploited different color shades in the max. 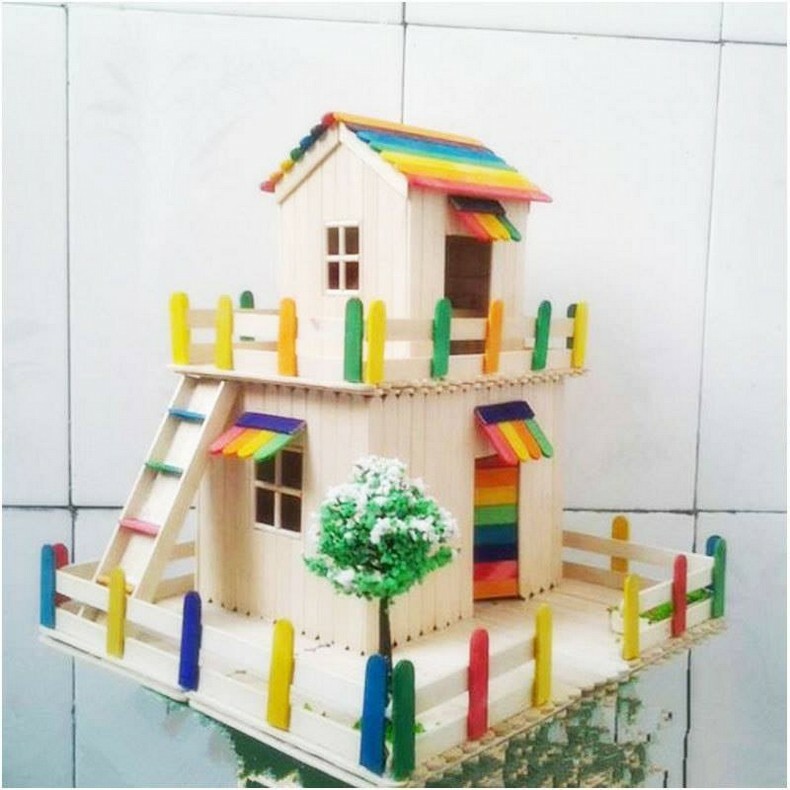 Each tier of the house was made purely with the same popsicle sticks making it a perfect model house. 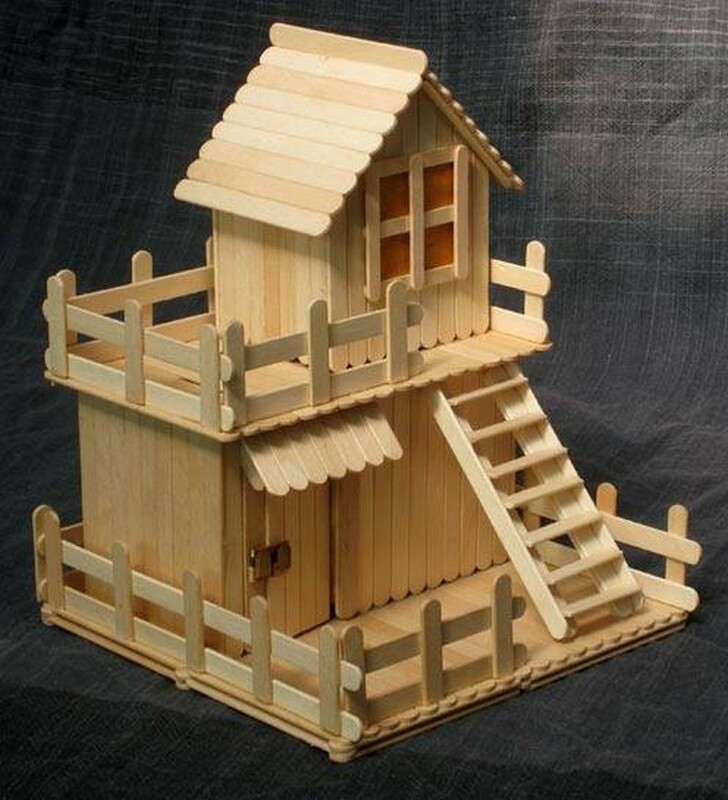 And now this one seems like a country side house with very simple and naïve construction plan. Like a plain indigenous wooden ladder is connecting the ground floor with the first floor. And we have used the colorful railing or grill all around the house as wooden fencing. Do you remember the movie TROY? Such castles that seemed invincible were seen in that movie and I was also obsessed with different characters from that movie. And here we have created the whole set that is similar to those events. Same invincible fort and the fighting armies. 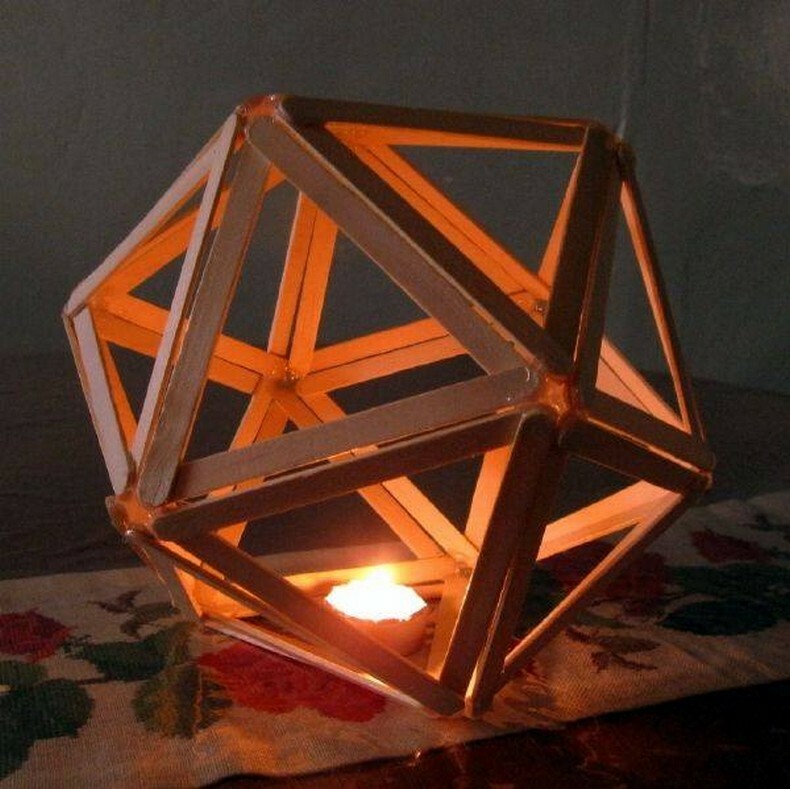 Wow, this small candle could have been placed here all alone, but we have just taken an initiative by covering it with this beautiful hexagonal structure that was made with the popsicle sticks. It feels like it has captured the light of the tiny candle. While going through these art projects they frequently remind me of the wooden pallet repurposed art crafts. 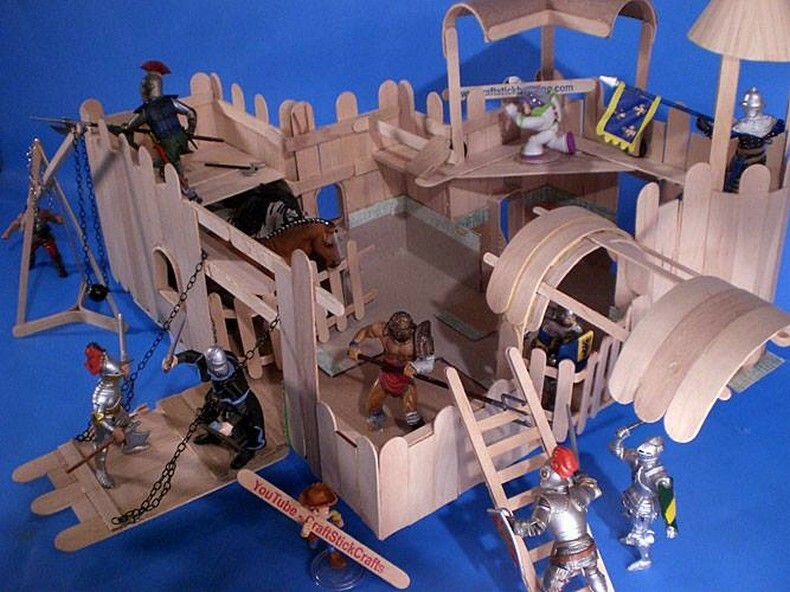 So maybe we have tried to copy them this time with the popsicle sticks. 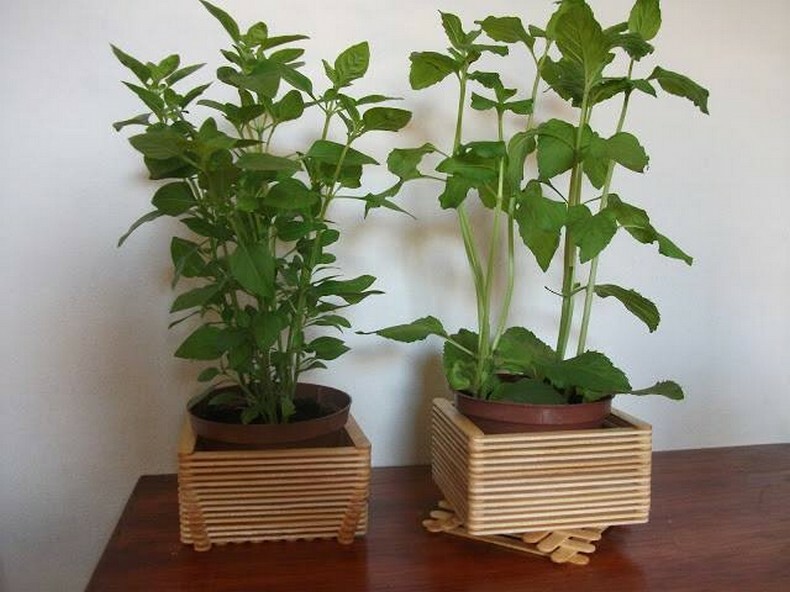 And these tiny small wooden planters have turned to be so perfect with their enormously nice shape. 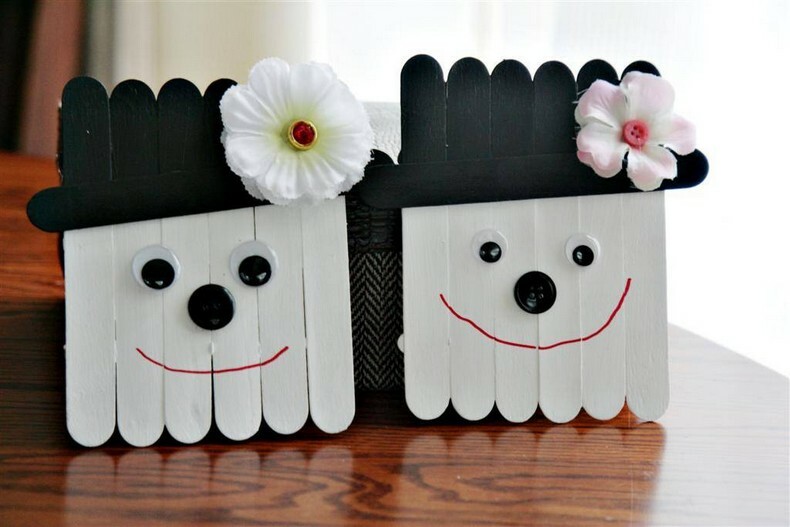 These cute little boxes remind me of the stylish and expensive stationary boxes that we bring home for luring the kids. But you know what, this time we didn’t pay much against them as we made them using the wooden sticks and staining them with attractive shades. Give them to your kids as a present and they would be just more than happy. 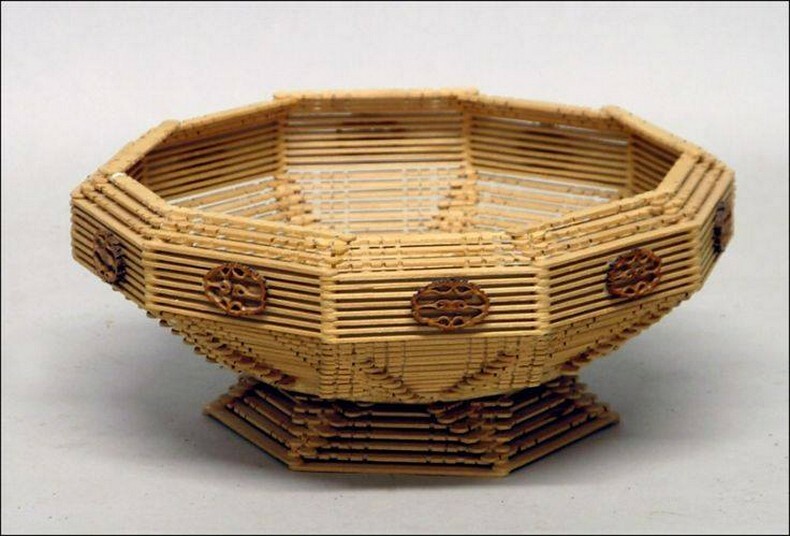 These wooden objects are clearly inspired form the wooden side tables that we see in the real life. 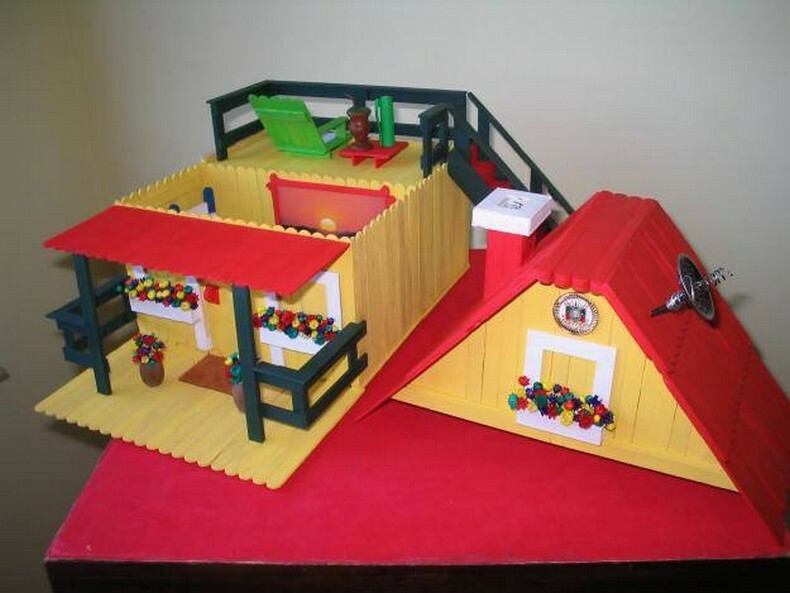 Here probably we thought to make this pair for the barbie’s house. She would care to place them beside her room bed. And trust me this one is going to be huge. 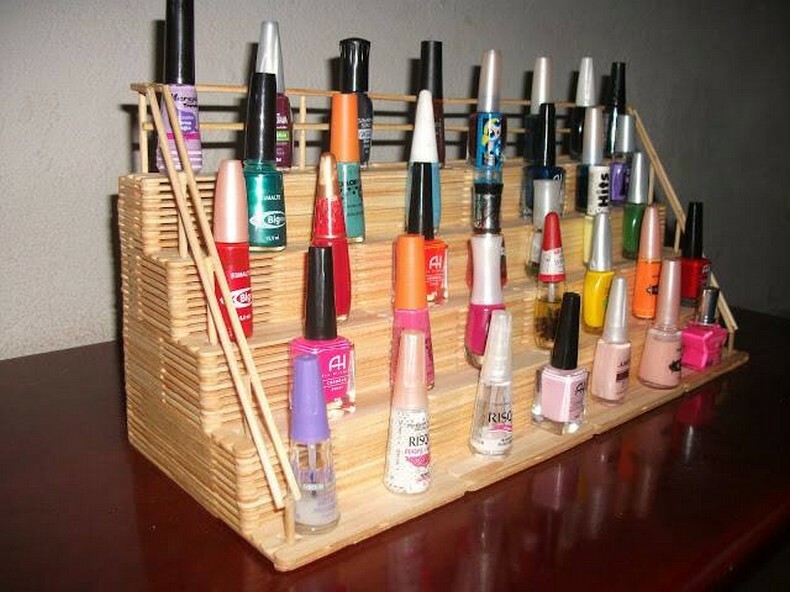 The only thing that you must be concerned about is the supply because you are going to need a huge quantity of the popsicle sticks in order to make this crazy vanity display. But the pattern is simple again which is certainly a relief. 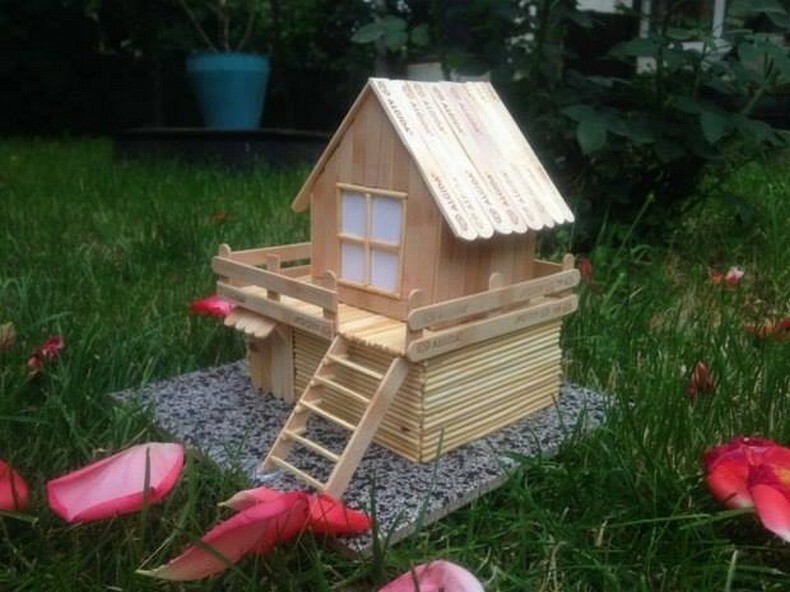 These little tiny houses also remind me of the small cartoon characters. Looking at this house it feels like some cartoon would suddenly appear out of this house that is built in some fairyland. But in the real life it could prove to be a perfect decoration piece for sure. 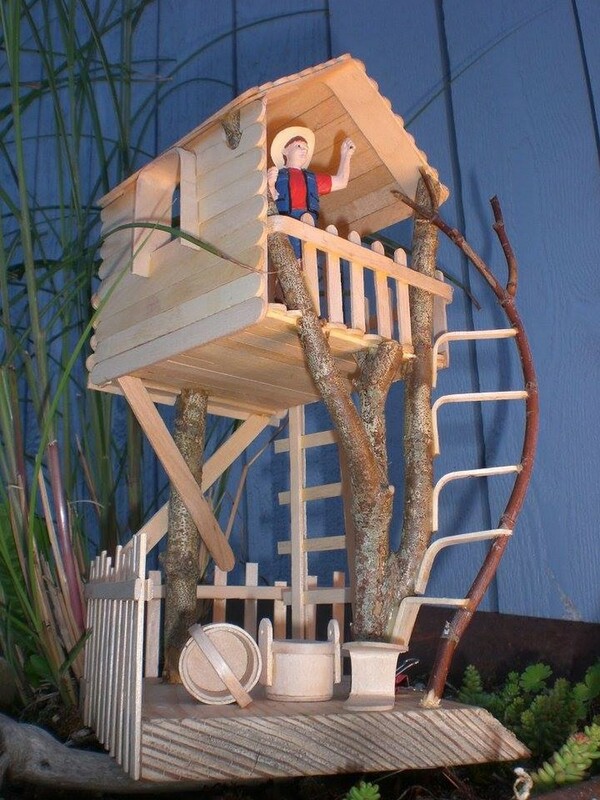 I remember recently we have had made a wooden pallet recycled tree house that was very much similar to this one. Seeing on a micro level we can count each popsicle stick to be a substitute of a pallet wood plank. That’s why each model is so perfect and cute. While this one is going to be pretty tricky so I would advise the beginners to stay away from this one. This can clearly be observed that this was made by some real mentor of the crafts by looking at the fineness and accuracy of the model. Many of the youth won’t be even aware of this, this is a well that used to provide water in the good old times when life wasn’t so much modernized. So just to keep those traits alive we have made this well with the popsicle sticks just to have a glimpse of the old time.